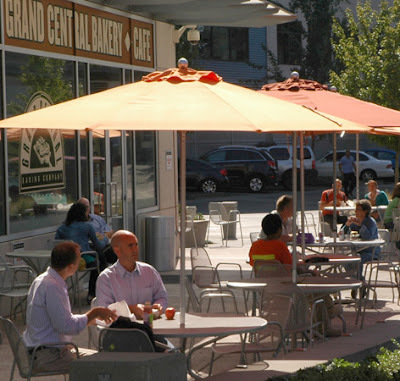 If you were hoping to wrap your hands around a sandwich today at Grand Central Bakery’s Pioneer Square location, or planned to pick up one of their new U-Bake pizza crusts and attempt to grill pizza outdoors tonight, may I suggest heading to Eastlake instead? Things should be crazy at the Pioneer Square original, seeing as Obama’s scheduled for a Grand Central visit with local small-business owners there just before noon. Or maybe you can wait to get your hands on a rustic baguette, sticky bun or whatever else strikes your fancy at the company’s third Seattle-area bakery/cafe, opening Friday at 626 S.W. 152nd Street in Burien. To celebrate that opening, Grand Central will donate a portion of the store’s August 20 proceeds to the Highline Area Food Bank and the Highline Schools Foundation for Excellence — an effort sure to get a big nod from the Big O.
Traffic’s sure to be bad all over, with Obama in town today for a Democratic schmooze-fest. Eastlake’s shop may be a better bet for lunch than the Pioneer Square location, though I suggest heading to Burien Friday to celebrate the opening of Grand Central’s third Seattle-area bakery/cafe.